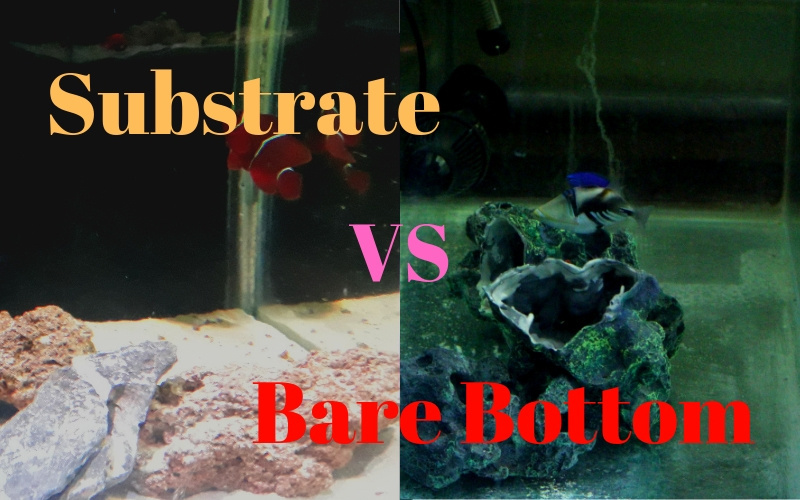 Substrate vs Bare Bottom, it simply means do I add sand to my tank or keep it bare bottom. There is much debate on this topic and confusing too. Substrate side says that this creates a natural environment for your fish and the other side says your tank stays clean longer. So, lets discusses the positives and the negatives of adding substrate vs bare bottom and what is best for your tank. Creates a natural environment– True, if I look at the ocean bottom it is full of substrate. So, it is giving that edge, which I need for the ecosystem. Hey, I am just trying to replica what is already there so adding sand would come very close to natural habitat. Adding to the Buffer- Some substrates can buffer the pH and hardness in the water. That is pretty good for a saltwater tank. Higher the pH to 8.0-8.5 would definitely help me in coral growth. Substrate for Marine Creatures- Sand is required for some creatures like gobies, shrimp, hermit crabs, sand shifting urchins and many more. Interestingly sand also hosts live food called good critters which can be pretty beneficial for picky fish. My Tank got the Looks- This is again debatable but some tanks, I have seen look fabulous with the black background and white sand. It just makes the reef look mesmerizing. Congrats for Adding Clean Time- Substrate are messy when it comes to cleaning. It is almost like wrestling for bigger size and for smaller size sands becomes difficult to siphon. Hitchhikers and Ugly Mates- Bristle worms, flatworms and Cyanobacteria can harass a saltwater aquarist. Most of these critters reproduce within the substrate and getting rid of the substrate is the only to get rid of them. Raised Water Parameters– Substrate traps down waste which should get cycled. The trapped waste then decomposes and increase nitrate, phosphates, ammonia and my blood pressure too. Easy on Cleaning- Bare bottom tanks are so much easy when it comes to cleaning. I easily use siphon for chucking out the waste from the bottom. More Flow- No sand helps me to increase the water flow and avoid any sand storm. Control Water Parameters- No substrate no waste traps, would ultimately help in controlling the parameters of water. It is easier to control my Nitrate and Phosphate with bare bottom. My Tank got the Looks- Now. I have seen tanks which look fabulous and are bare bottom. So, we have to take this point as positive for both as we can debate all day long on the looks. No Substrate for Marine Creatures– What is the use of sand shifting goby if I don’t have sand so all sand shifting marine life goes out of the tank. Beneficial Bacteria– With bare bottom the beneficial bacteria for biological filtration is quite low and have to depend mechanical. Risk of Rock slide – Greater risk of cracking the bottom glass as it is little difficult to balance rocks with the substrate. So, if top rock slides I might land into trouble. Personal preference, frankly we can die debating on this topic. I have both bare bottom and sand bed tanks. The conclusion I draw is the beauty lies in the beholder. Both have enough pro and cons so, simply the ball is in your court to decide what is good for you.